FEATURES. 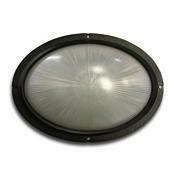 Housing consists of a cast aluminum backplate and casting with an injection molded polycarbonate opal white oval lens. Standard size is a 13¾" width x 10" height with depth options of 4", 6½", and 8" deep. Universal voltage 120/277V electronic driver in the housing sealed by temperature resistant non-aging .1875" thick neoprene black rubber and EPDM gasketing. Corrosion and weather resistant oven baked standard black polyester powder coated finish. U.L. Listed for Dry or Wet Locations with 4-point mounting.